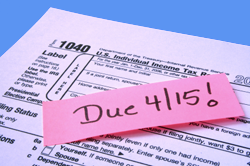 Generally, Individuals are required to file and pay their taxes on or by April 15th. A six month extension is available, however the extension is only for filing the return and not for the tax due. Generally, Partnerships are required to file their tax returns 3 1/2 months after the close of their tax year. Thus calender year partnerships must file by April 15th. A five month extension is available. Generally, C-Corporations and S-Corporations are required to file their tax returns 2 1/2 months after the close of their tax year. Thus calender year C-Corps & S-Corps must file by March 15th.